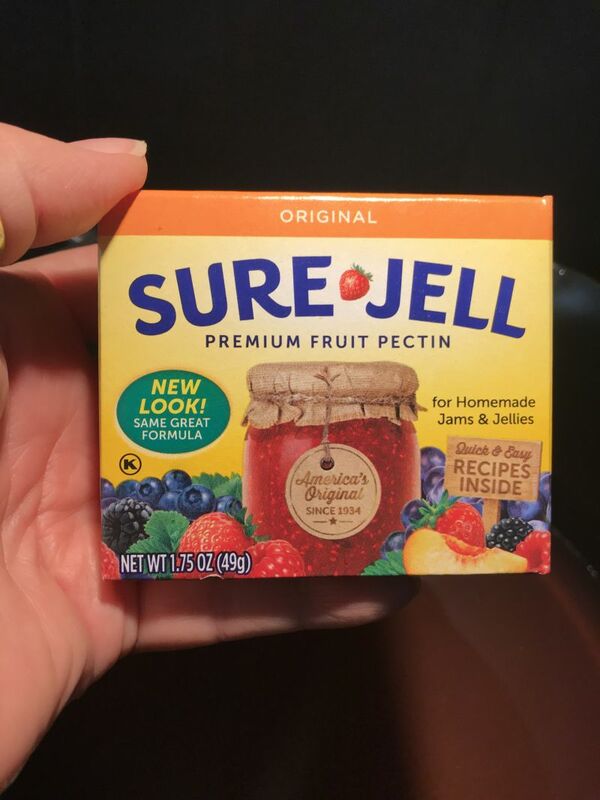 I am so excited about this wine jelly, that I can hardly type fast enough to keep up with my brain! This is going to sound crazy, and you are going to feel like you want to stop reading this post as soon as I say what it is about…but DON’T! You can do this! And when you taste your amazing results, you are going to want to shout from the rooftops! Ms. April: Hey, you know how you have leftover wine that you don’t know what to do with? Ms. April: I mean, you know when you have people over, and open a few bottles of wine, and there is a bit of wine left over and you have to throw it down the drain? Ms. April: OK, you know when you open a bottle of wine in the evening with The Brit, and there is a bit left over and you hate to have to throw it away because it doesn’t keep? California Girl Comments: Ok folks, I’m not really the alcoholic Ms. April paints me to be. First of all, I have the proper tools at my house to store wine. I have just about every gadget known to wine person. We will be writing about these tools in the upcoming weeks. I can store my wine for more than a day without too much damage. I don’t store wine for longer than say two days but there are tools that can do it. 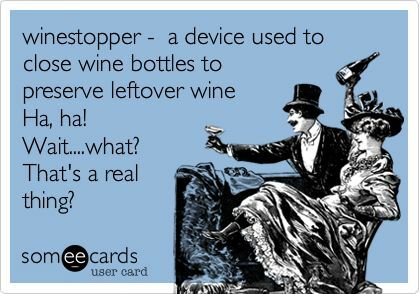 But really when you have a bottle of $50 – $100 wine, there is no way I am throwing that goodness down the sink! The Brit will happily take one for the team and drink it up so it doesn’t get thrown away. The only wine that goes down the sink is the stuff that is so unpleasant that I can’t possibly drink it. (Usually, it is from our bargain wine of the week category.) You can’t use bad tasting wine for the jelly. 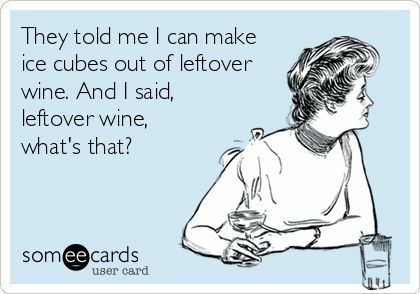 From now on, I want you to save your leftover wine. Re-cork it and put it in the refrigerator. I don’t care what kind of wine it is, other than keeping the reds, whites, and rosé wines separately. Don’t put them in the same bottle of leftover wine. Got it? 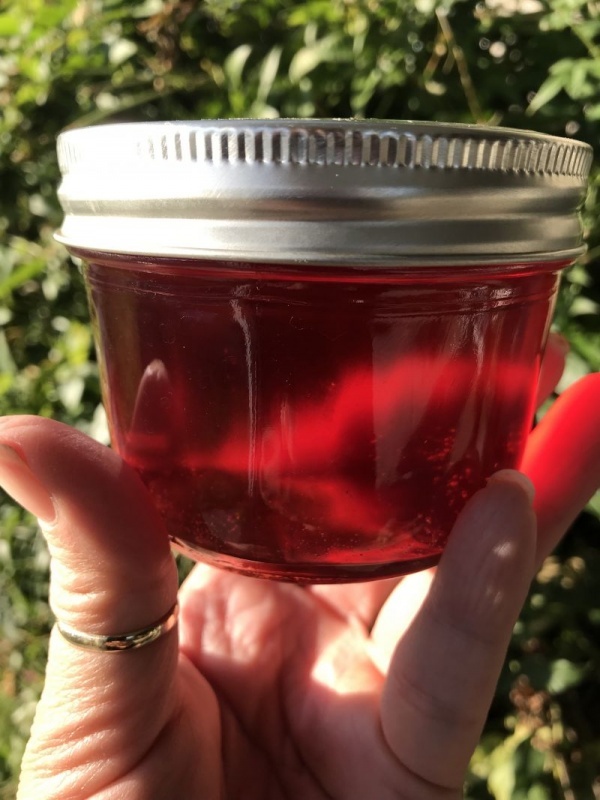 Even if you don’t have leftover wine, which probably only applies to California Girl, this fabulous wine jelly can be made with a $3 bottle of wine from Trader Joe’s. I am not kidding. It doesn’t have to be fine wine. 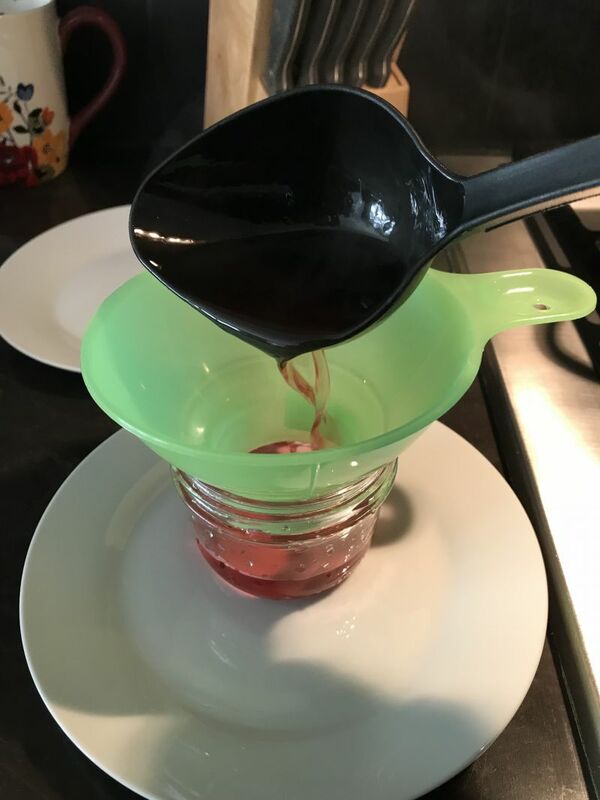 For Christmas gifts at work this year, my daughter and I made Wine Jelly. Before you turn your nose up, let me tell you it is the most amazing taste on cream cheese and a bagel, or over mascarpone and crackers, that you have ever tasted in your entire life. I don’t even drink, and I literally scooped out all the leftover from the pot with my finger and ate all of it. Even if you have never canned before, you will be able to follow these simple directions and do it. Not only will you have a wonderful jelly for a meat and cheese tray, but you will have little lovely jars of decadent wine jelly to give as gifts. Seriously. It is amazing. 750 ml of wine. (One bottle is 750 ml) or, 3-1/2 cups of leftover wine. 1. 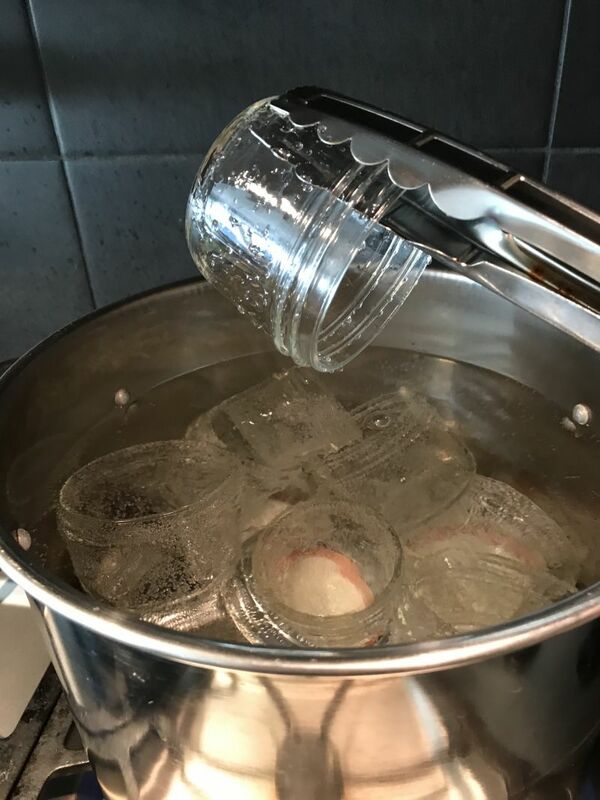 Before you do anything, take the lids and rings off of your half-pint canning jars and put in a big pot of water. This not only sterilizes the jars and rings but gets the rubber on the lids hot enough to seal. Bring to a boil and then keep simmering once it is hot. 2. Set up your workspace by placing 2 saucers on the counter next to the stove, and place the canning funnel on one saucer. 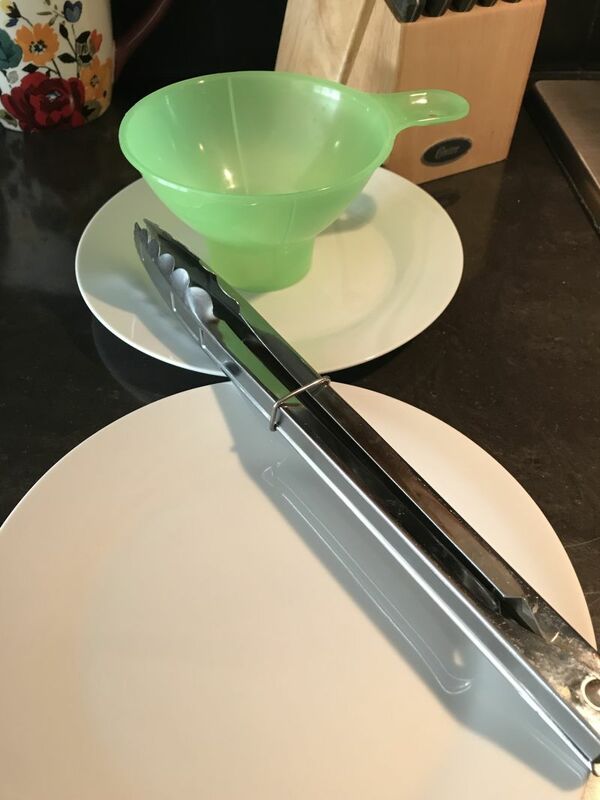 Place the dishtowel next to the saucers with the metal tongs. 4. 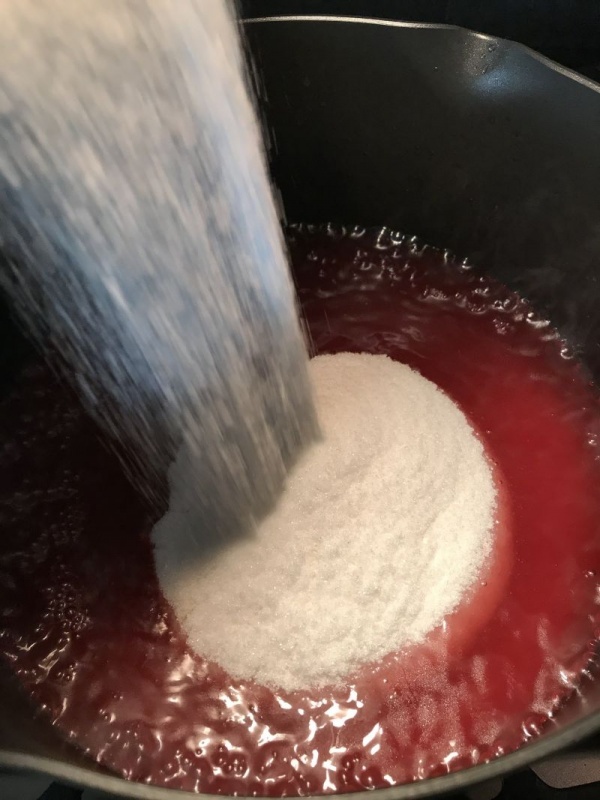 Stir in 1 box of pectin until completely dissolved. 7. 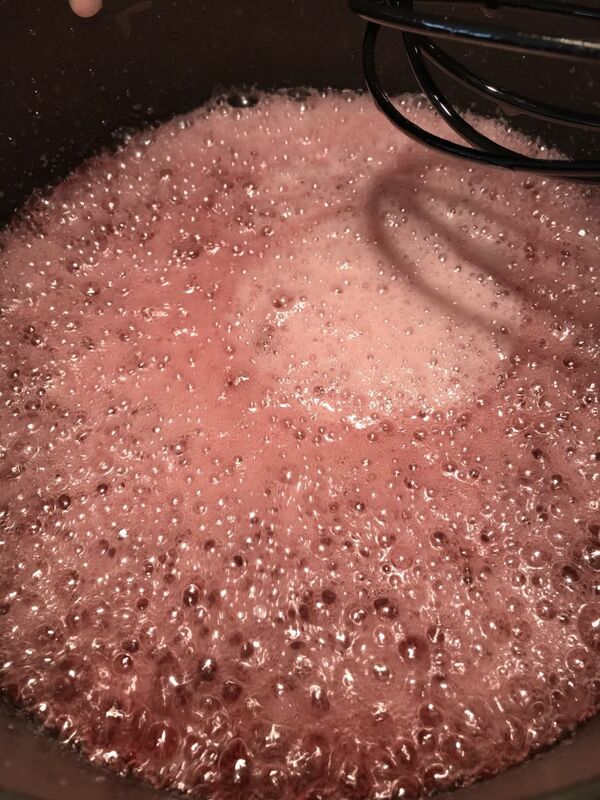 Add the sugar all at once and stir until completely dissolved. 8. 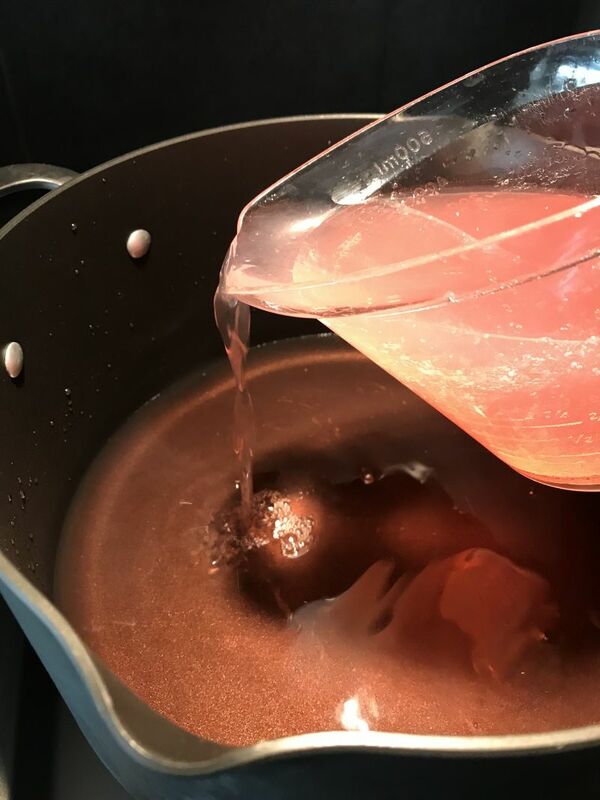 Keep stirring and bring to a rolling boil. Once it is vigorously boiling, set the timer for one minute and allow it to boil. 9. When the timer goes off, turn the heat off of the pot. 10. Using the tongs, retrieve a hot jar from the boiling water and place on the saucer next to the pot on the counter. 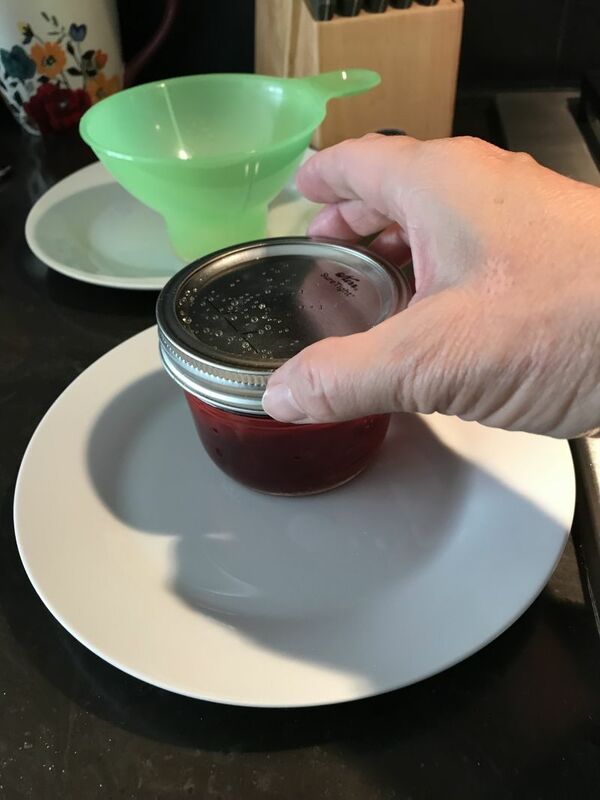 Place the canning funnel in the top of the jar, and ladle the hot jelly into the jars, leaving 1/2 inch of space from the top of the jar. I like to just use the saucer to hold the jar next to the pot of jelly, so I don’t spill and I don’t handle the hot jar. Once full, place the saucer back on your workspace or counter. 12. 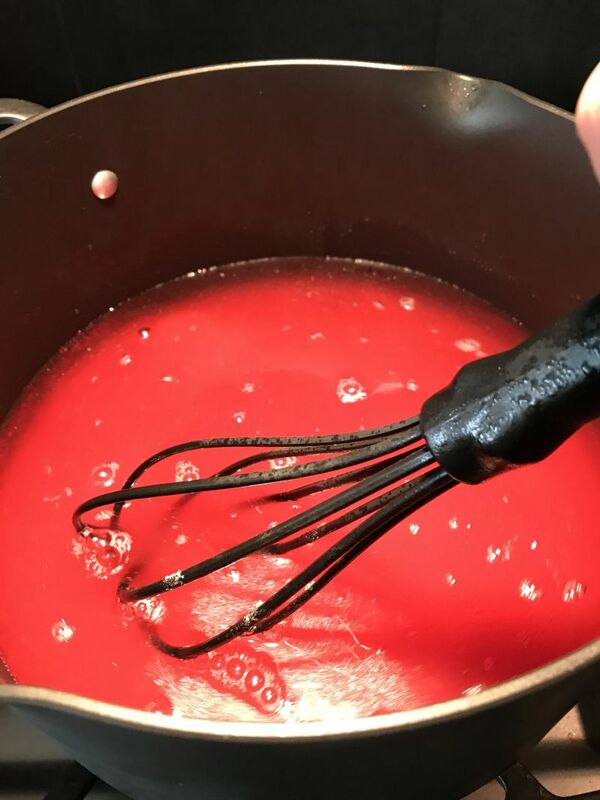 Using the tongs, remove a hot lid, and a hot ring from the boiling water and place on the top of the jar of jelly. 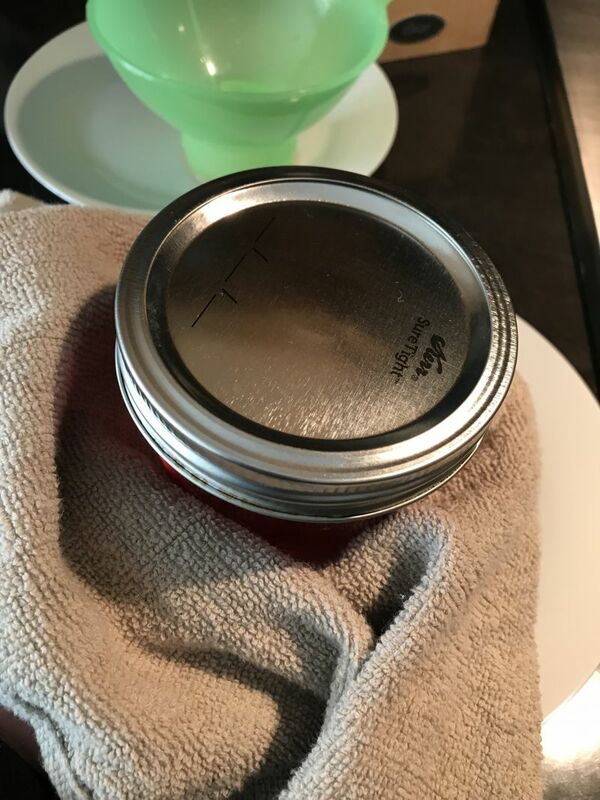 Tighten the lid snugly, and then use the towel to hold the jar and make sure the lid is snug. Place on a towel to cool on the counter. 13. Repeat until all the jelly is in jars. 14. 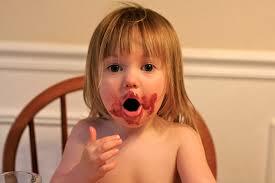 You are going to have a tiny bit of jelly left over, that is not quite enough to fill a jar. Pour it into a small dessert bowl, and allow it to set up so you can enjoy it after you do the dishes! 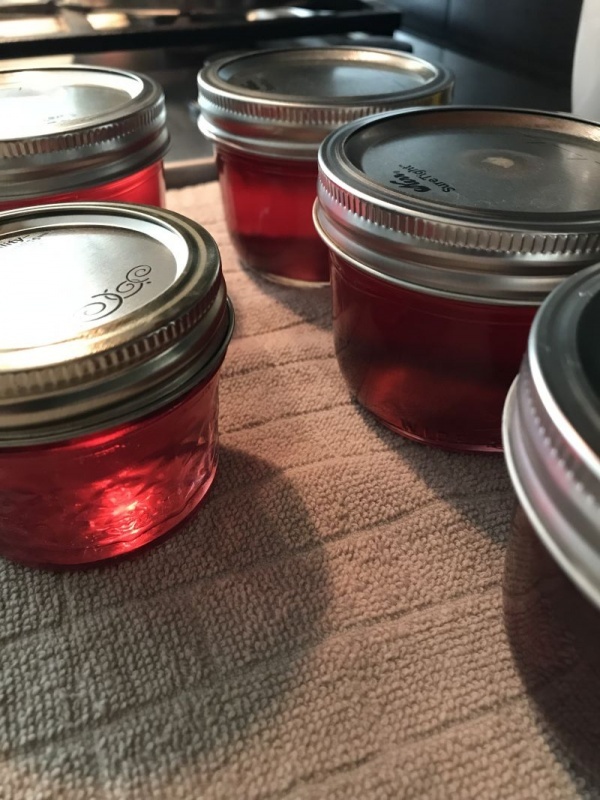 As the jelly cools, you will hear a “ping” as each jar seals. A vacuum is created in the jar as it cools, and the lid is pulled down, creating the “ping.” I actually mentally keep track of the pings and count how many I hear as they cool. 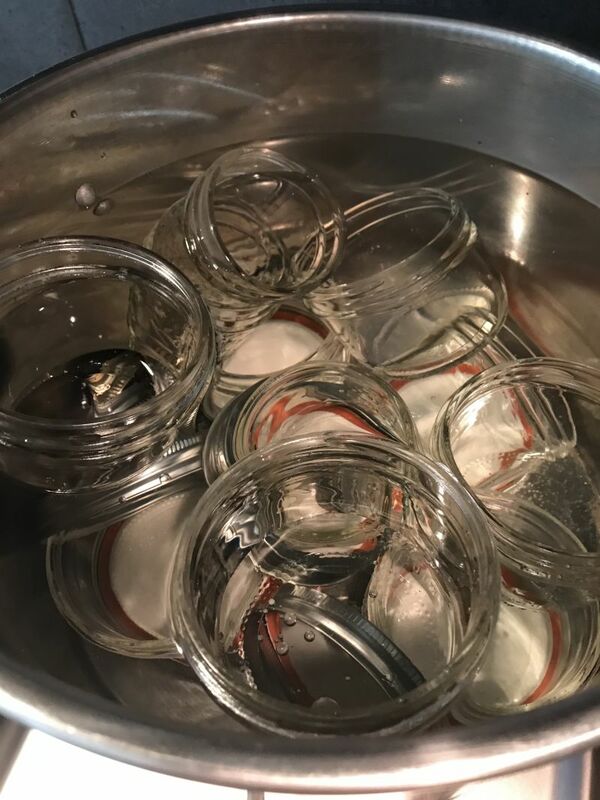 You can check to make sure each jar has sealed by pushing down gently on the top of the lid after they have cooled. If the jar has sealed, there will be no “give” in the lid. It will be concave. If the jar hasn’t sealed, the lid will push down. If that happens, just put that jar in the refrigerator for your own use. The sealed jars can be stored in a cool place, like the pantry, until used. Refrigerate after opening. Make sure you label the lids with the contents and the year that you made it. These make lovely gifts if you can bring yourself to share. Pop a bow on top and a label, and you’re done! 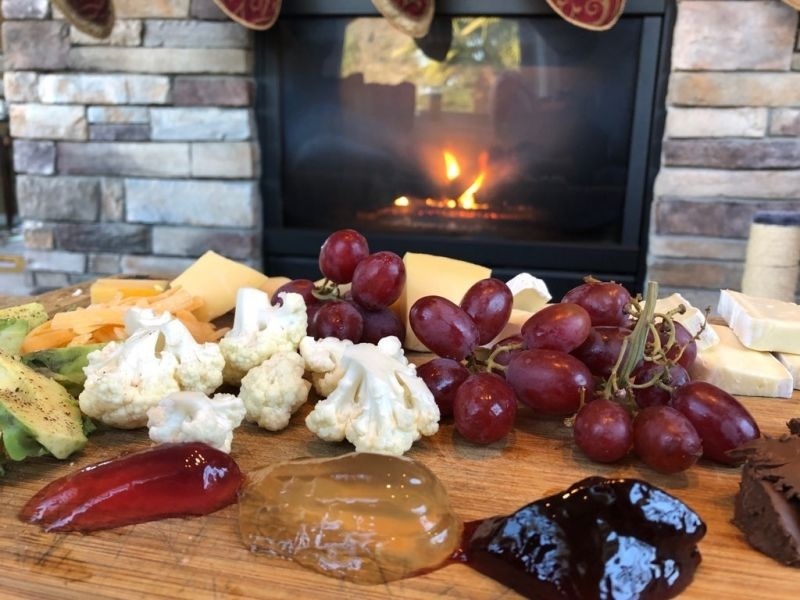 Wine jellies on a plate of fruit veggies and cheese! Thank you to our readers Charlotte and Matt Haisch of Cottonwood California for this beautiful photo of our wine jelly! Delicious on a bagel or croissant with butter, or over cream cheese or mascarpone. 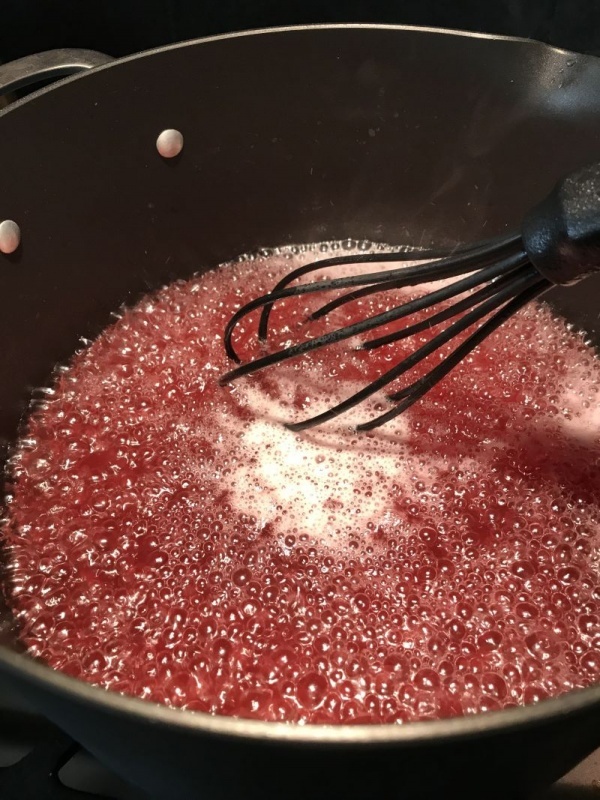 I have never made a jam or jelly before, so why not start by making a wine jelly! I am all about this idea. No wine goes wasted!! I still don’t know what all of this wasted Wine is about… *shrug* Thanks for commenting! Let us know if you make it and how it goes! Fun idea and I’m sure my husband would love it. He’s not much of a wine drinker, but if it’s made into a sweet jelly, well, that’s different! 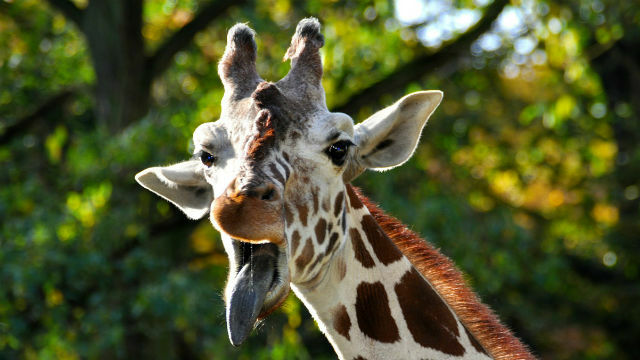 Hi Lauren.. thanks for commenting! 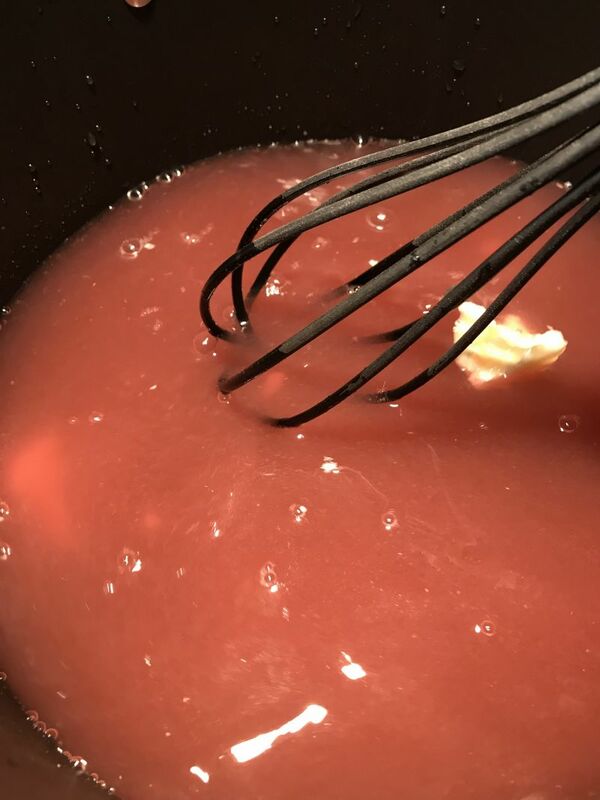 If you make the wine jelly, please let us know! There is a winery in Paso- Penmann Springs that makes their own wine jelly. It oh so yummy! 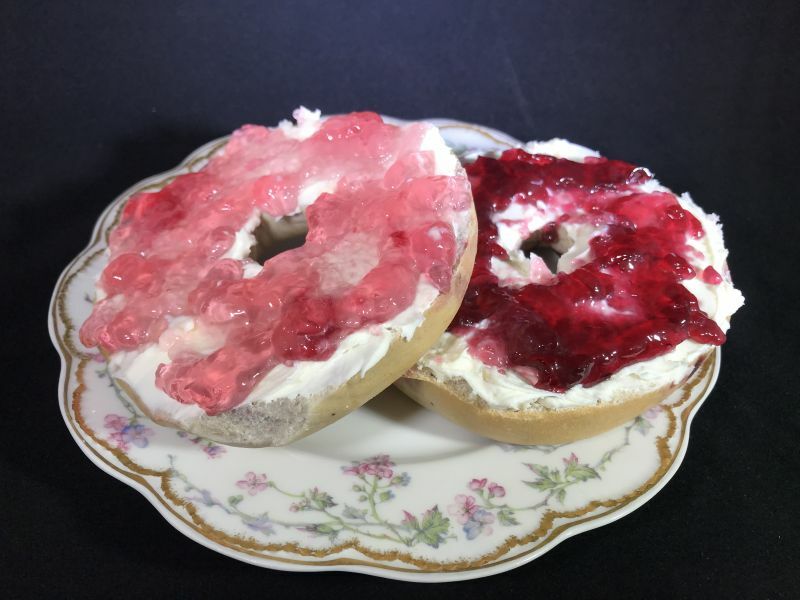 I never knew that wine jellies do exist and that it can be best served on cream cheese and bagel, as well as a perfect Christmas present. This sure sounds exciting since most of my friends are wine lovers that we would go out to a wine bar every weekend to relax. Sounds exciting! I’ll try to read more about this and the several flavors to choose from so I know what to look for in the market!